I am obsessed with blackberries. everything blackberry inspired that you can imagine. And the other day, I found myself basket & scissors in hand clipping away. 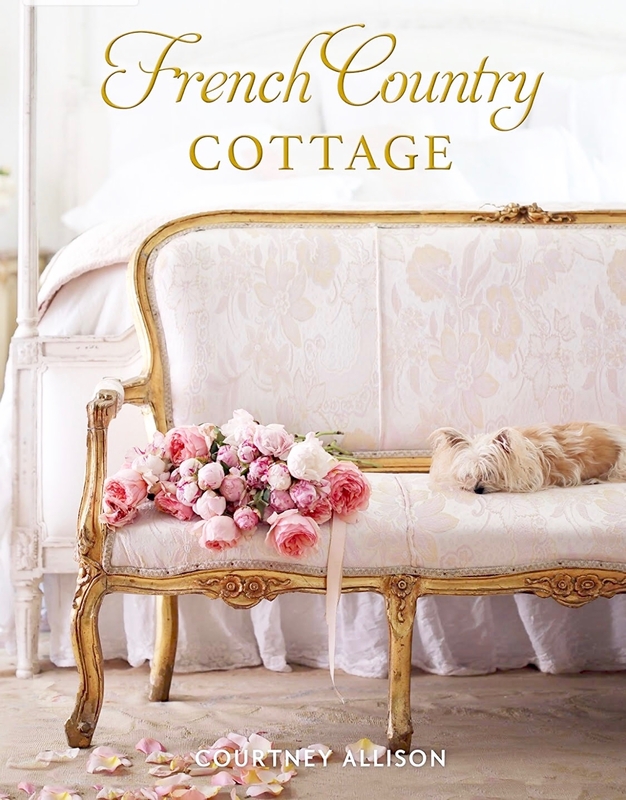 easy and elegant entertaining month over here on French Country Cottage. 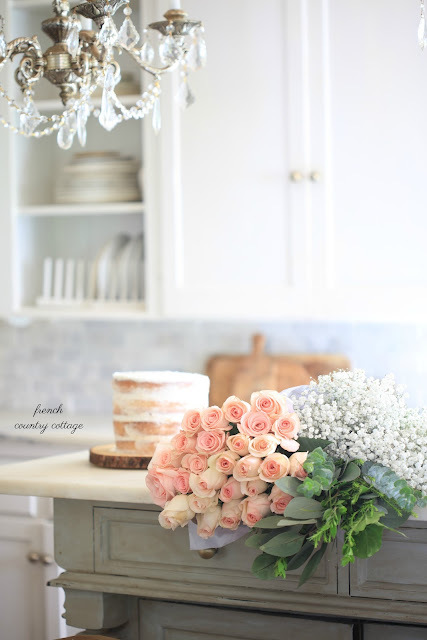 Easy, simple, inspired AND deliciously delightful entertaining ideas. 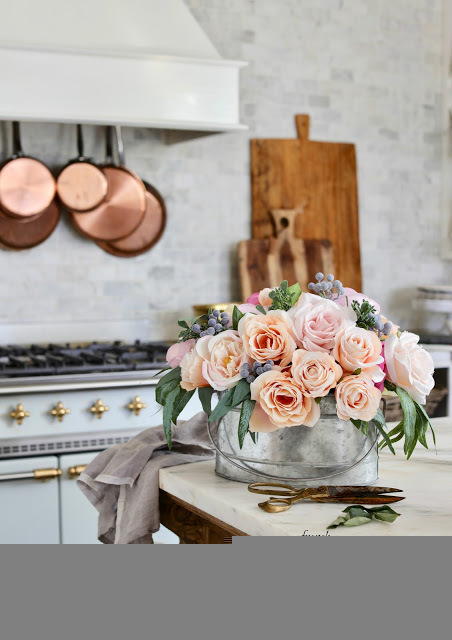 Spilling the beans on my go-to ideas for entertaining and serving with style and let you mingle at the party without being in the kitchen half the time. And today, we are talking desserts. they are definitely some of my favorites. And in the winter, baking layer after layer is a good thing and warms up the house a bit. But in the summer? That oven does not like to come on. This is a 4 layer decadent delicious cake stacked with frosting and toped with berries and blooms. And that took about 15 minutes to make. It is a freshly baked cake. Let's start with a trip to the market. 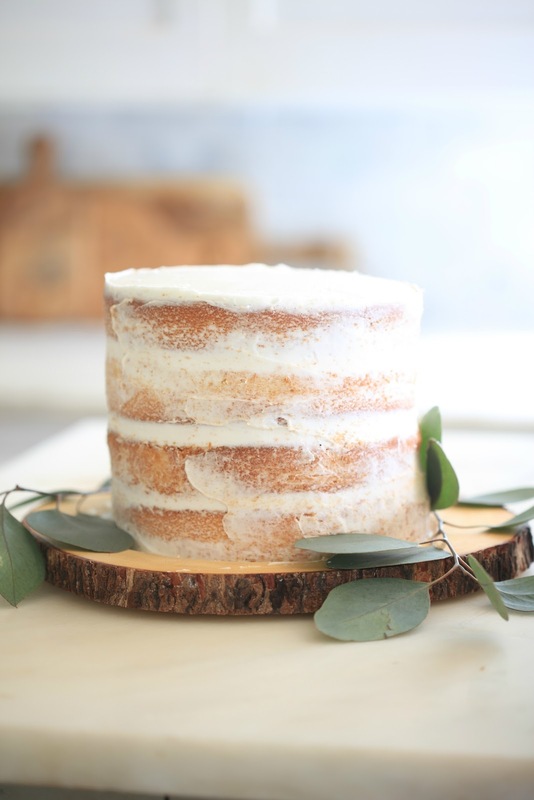 you can purchase 'layers' of cake that are unfrosted? And a tub of frosting that they just made that morning. Just go to the bakery department and ask. 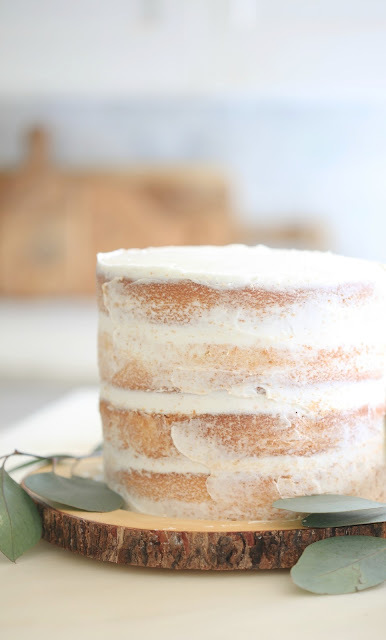 So, I picked up 4 layers of white cake- at $2 a layer. but honestly, strange preservative ingredients aside- this frosting spreads like butter as they say. Really does go on much easier- so it is worth the extra to me. and repeat, repeat, repeat- until all your layers are in place. 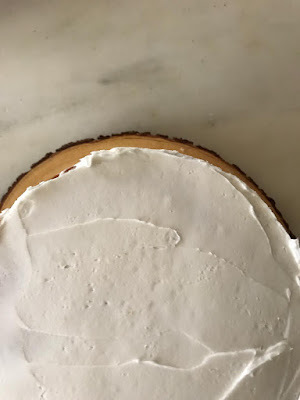 Then you want to take that frosting and frost the top- and then pull your knife around the sides of the cake to 'smooth' it and smooth those in betweens. Don't press too hard- but use a smooth knife to make sure you don't stir up too many crumbs. so don't stress when it looks like the above photo. And smooth your top making sure to keep the edges simple and rounded as you go. 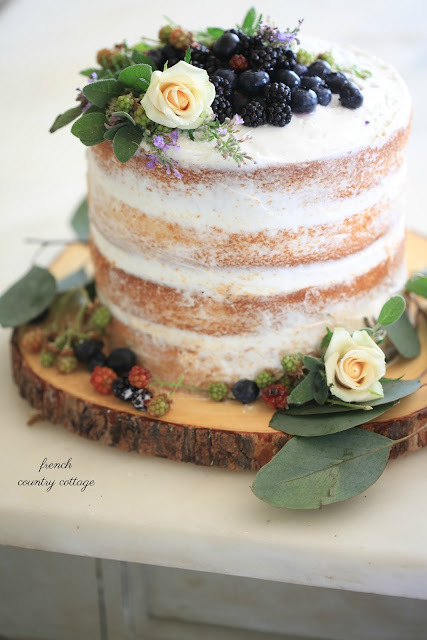 Once that is wrapped- you will have the start of your rustic aka 'naked' cake. 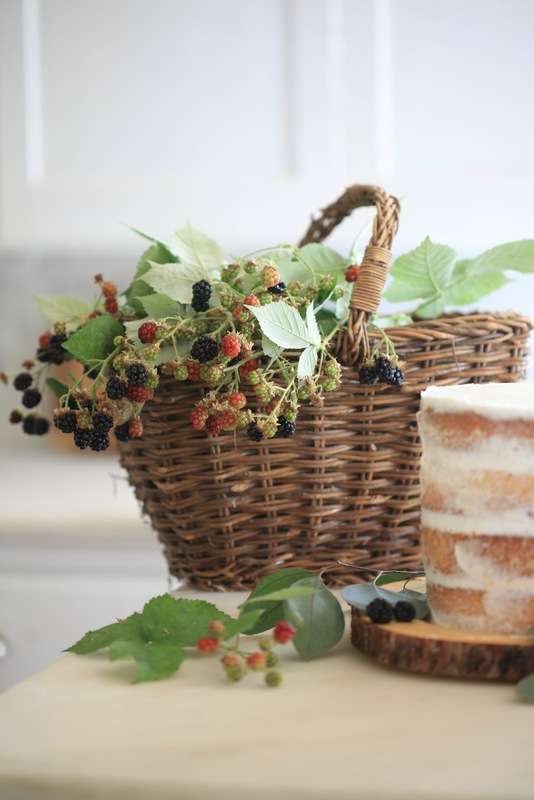 Enter my basket full of fresh picked berries. You can use store bought blackberries & blueberries- just make sure they are fresh rather than frozen. You do not want a whole mess of blackberry juice all over your cake as they thaw. I also clipped fresh herbs and flowers to use. I used sage, catmint and lavender- and small baby roses. 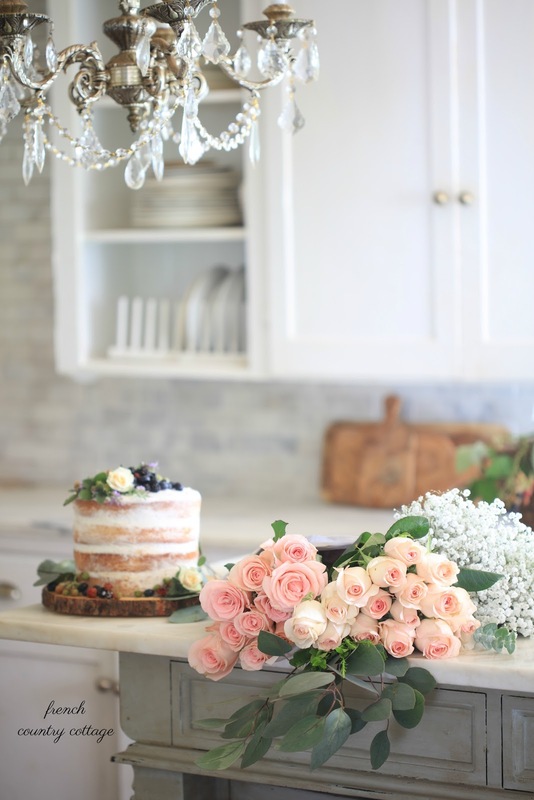 Note: The key when using flowers and greens on your cake is to make sure they are safe. Google ahead of time- and a tip is to stay with herbs for decoration. They are used in teas and cooking which means they will be safe as a topping. (you can find these at a bakery) so that the flowers do not touch the cake. And of course- don't let anyone eat them. Or another option is to use faux and forget about worrying about it. 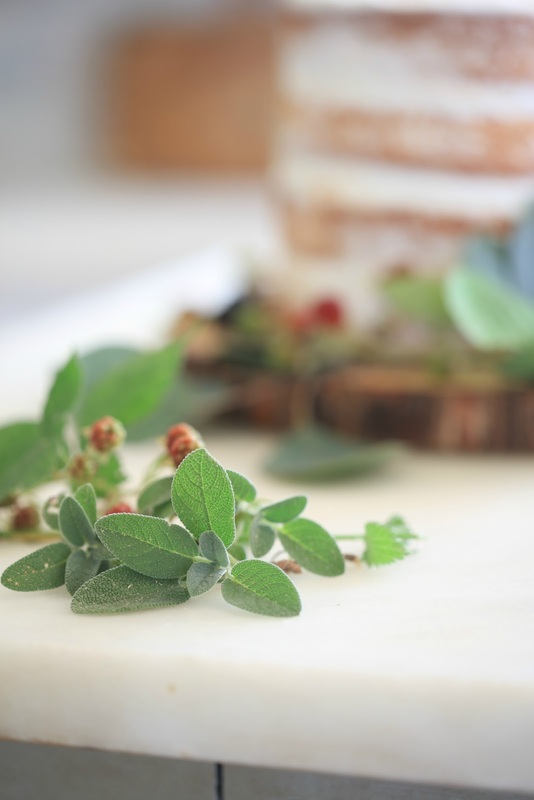 I layered the sage and catmint to create a simple little decor on half of the top of the cake. creating a 3/4 topped cake. or use paper leaves if you would prefer for added oomph. And then add a few fresh berries, blackberry branches and leaves. I decided I also wanted a few roses- but the ones I had picked up at the store were too large. and added just 2 of them as a finishing touch. and keep them as decoration (not on the top) so no one nibbles on them. And when clipping blackberries from your yard- wear gloves and closed shoes. Yes, I did manage to get 2 thorns in my toes by wearing my flip flops. And I don't even want to talk about how many times they got my fingers. and stay away from any that are not organic or may have been sprayed with anything you don't want to be eating. And avoid those 'over ripe' berries to avoid 'berry drip' all over the cake. It isn't a pretty thing. Simple, decadent, delicious and easy to make. And perfect for summer entertaining. a wine country cheese board and all the essentials. Because, who doesn't love the wine country and cheese boards and all that deliciousness. And best part- it is so easy to put one together. I am off for a bit of exercise - and I have a tub of grout with my name on it. What else would you like to see in the Easy and Elegant entertaining series? Gorgeous. I didn't know you could buy cake layers at the bakery. I have to remember that one. Thanks. Thanks for the tip about buying unfrosted layers and frosting. Definitely going to check our local stores. 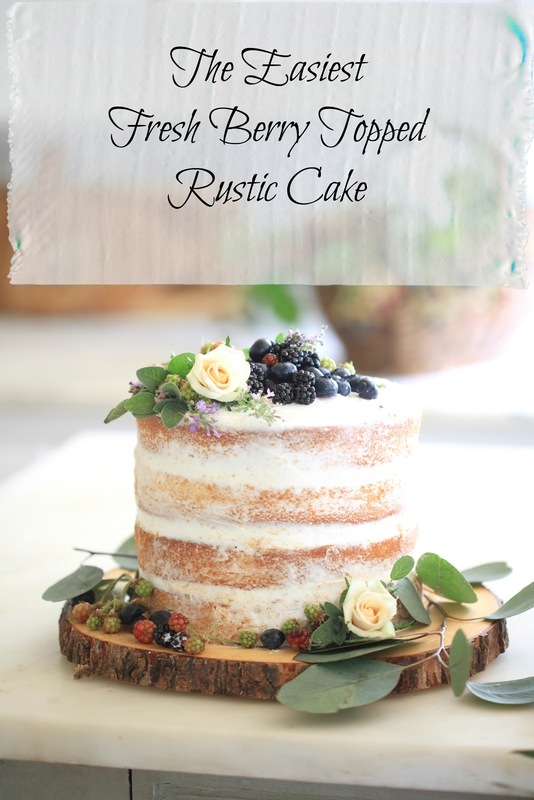 This rustic cake looks absolutely beautiful, and looks like you spent hours fussing with it! 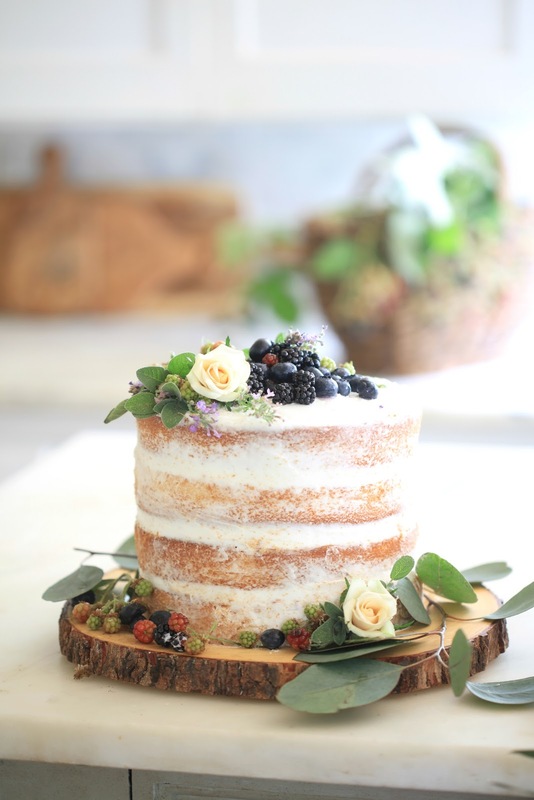 I did not know about purchasing "naked" cakes and bakery frosting from grocery store bakeries. That's a great tip. I appreciate your cake decorating tutorial and look forward to trying it out. Thanks for sharing. What a great tip to purchase cake at the local grocery . I will need to ask. 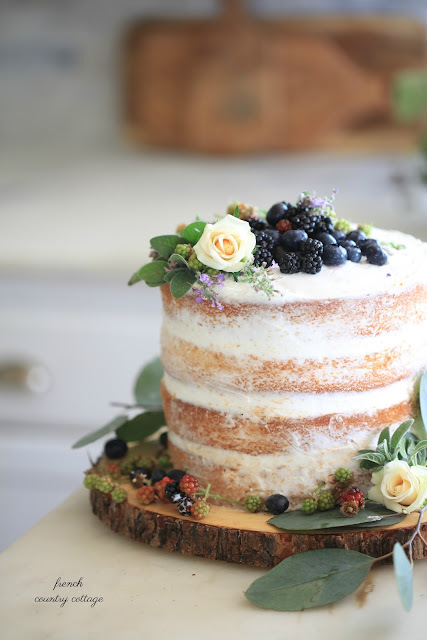 Love the look of this cake! Everything you touch becomes so incredibly beautiful! 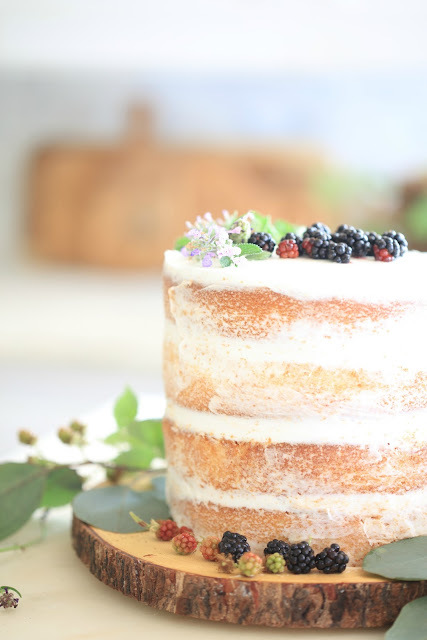 I've made a few naked cakes and they are never quite this lovely. You have such a gift. Simply beautiful! I didn't know that buying layered cakes and already made frosting were an option at the bakery stores. Thank yo so much for the tip. I'm going to have to ask about getting a couple of unfrosted cakes when my inlaws come in September. Your cakes always look soooo pretty and delicious! 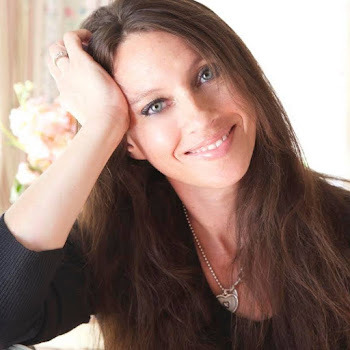 Happily pinned and G+ shared for you. Courtney, this is absolutely beautiful! 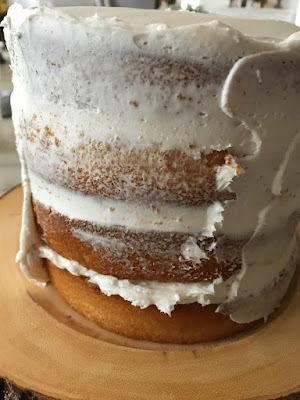 Thanks for the tips about purchasing the cake layers and frosting. 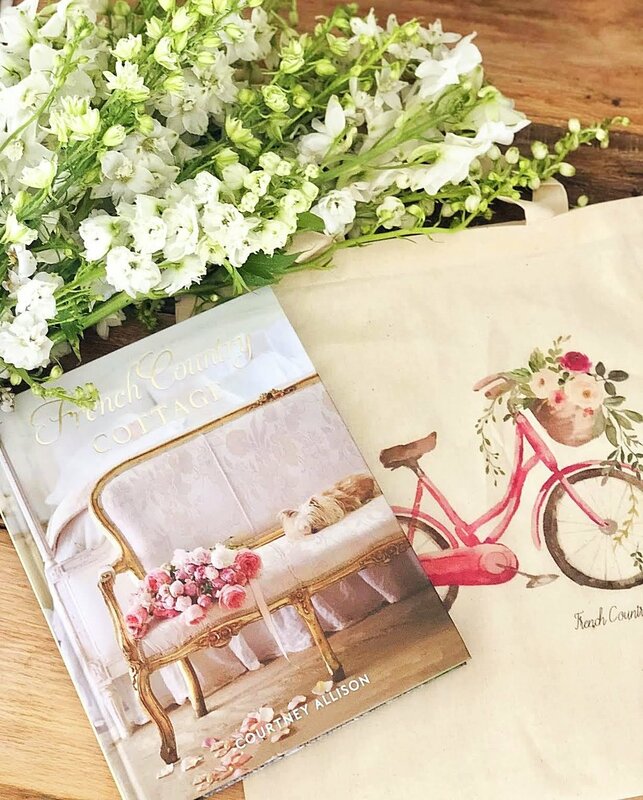 I am saving this post to Bloglovin'. Love that unfrosted layers can be purchased at grocery stores, takes beautiful layer cakes to a new level in my house, and frosting too. Beautiful cake and thanks for the tips. Love the cake, great tip to purchase from local bakery! Going to have to remember it, the next time I need something fast. The cake is absolutely beautiful by the way. Thank you for the tip on buying cakes from a bakery. I love entertaining but I stress because I try to make everything from scratch. I need to change some of my food prep methods so I enjoy myself more. Courtney, Thank you for the great tips!it looks delicious.